By Sam Meadows in Good News Story on August 30, 2018 . My Gran used to go to South Africa a lot and there was a special shell on the beaches there called a Pansy shell. It is an amazing work of nature that is only found in South Africa. She gave me one of the delicate pansy shells after a trip to South Africa years ago and I still have it wrapped in tissue paper. 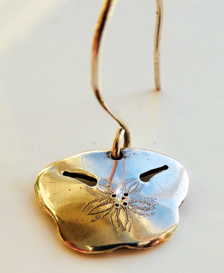 When she died, she had some earrings with the pansy shell design on and I decided to keep them. Years have gone by, and I hadn’t worn the earrings for a long time. Out of the blue a few months ago, one of the earrings appeared on the bathroom windowsill. I have no idea why it was there. I hadn’t put it there. Nor my husband. It was so strange it just appeared there! I picked it up, remembering my Gran and thought it would be good to wear the earings again. I found the other one in my jewelry box. However, as with all silver, they had got very tarnished and dirty. So I got my silver cleaning cloth and cleaned them up. The cloth was very dirty when I had finished, but the earings were now shiny and bright. I was amazed how much more detail of the design I could see. 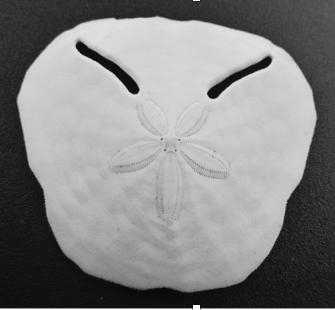 The intricacy of the etching of the shell on the front. 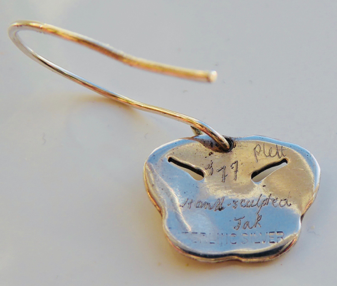 But as I turned them over to the back of the earing, I saw that the name of the designer was there, “Hand sculpted Jak”. I had never known that was there, and before I cleaned them you could see nothing on the back at all. God spoke to me very clearly at that moment challenging me as to consider what tarnished me and stopped others from seeing my creator, God, in me. I am His hand made creation, and yet there are times when distractions of all kinds tarnish me, obscuring my Creator. What tarnishes you? What distractions do you need to remove from your life to come closer to God and allow the Creator to be seen in you more clearly?